Poland’s government has approved draft legislation that would reinstate the slaughter of livestock according to the customs of Jewish and Muslim minorities. The practices of Jewish shechita and Muslim dhabiha livestock slaughter, which see animals killed without prior stunning, were banned in December 2012 by Poland’s Constitutional Court following a campaign led by animal rights groups. However, Poland’s agricultural minister Stanislaw Kalemba warned that by outlawing the predominantly export business, several thousand jobs would be lost. According to Prime Minister Donald Tusk, “the new regulations on the matter will however eliminate the most shocking methods of animal slaughter,” as outlined at a press conference on Tuesday, quoted by the Polish Press Agency (PAP). Tusk specified that the slaughter of animals in rotating cages is one practice that will not be reinstated. According to that practice, an animal is placed in a steel cage that is turned upside down, with just the head sticking out, and then the throat is cut. The amendment to the law on the protection of animals will likewise insist that any slaughter of livestock according to kosher and halal methods is done in a slaughterhouse itself. Poland wants to re-legalize ritual slaughter, but with limits on what the country’s prime minister called the cruelest practices, after a legal challenge to the procedure to produce kosher and halal meat last year pitted the country’s powerful agriculture export industry against animal rights activists. At present, the niche industry that generates billions of euros every year remains in legal limbo after a Constitutional Tribunal ruling last November. 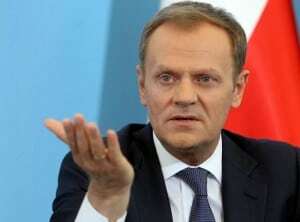 Prime Minister Donald Tusk said the government would draft changes to address concerns of both sides. He added that Poland’s ritual slaughter legislation won’t diverge from the European Union’s directive which dictates that animals be stunned before slaughter, but allows states to make exemptions for religious reasons. The government’s junior coalition partner, the Peasants’ Party, which counts Polish farmers among its constituents, is in favor of passing an amendment to allow the practice of slaughter without pre-stunning for religious traditions. Since the Constitutional Tribunal ruling, the public debate in Poland has focused on the impact slaughterhouse closures would have on unemployment and lost export revenue rather than religious-versus-secular values, unlike the circumcision-ban ruling in Germany, or French and Swiss restrictions on head scarves and minarets. Many large companies in Poland are in the midst of multi-year lay-off programs of thousands of workers each. Poland, an overwhelmingly Catholic country and an agricultural powerhouse, has tiny Jewish and Muslim communities, but the turnover of niche sector of halal and kosher abattoirs that export their production to countries like Israel and Turkey, as well as to western Europe, has been growing 20%-30% a year, said Witold Choinski, president of meat producer lobby group Polskie Mieso. “The meat production sector’s total turnover is 40 billion zlotys ($12.7 billion) and it employs 90,000-100,000 people,” he adds. “Several thousand people work in halal and kosher slaughterhouses in Poland,” he said. The country’s Constitutional Tribunal found an Agricultural Ministry derogation exempting religious slaughter from the requirement of pre-stunning was non-compliant with the Polish Animal Protection Act. The ruling, which made ritual slaughter illegal from January 1, 2013, led to protests by religious communities. Polish halal and kosher meat has enjoyed a cost advantage because Poles don’t eat much beef, from any type of slaughter, removing domestic price pressure, and because its beef producers use the cheapest method, outdoor grazing, said Mr. Choinski of the meat lobby group. Poles prefer pork. Another factor facilitating kosher exports from Poland to Israel: many Israelis have family roots in Poland and speak Polish. “As long as there are 1.8 billion Muslims, there will be a market for halal … and Poland should take advantage,” said Dr. Mohamed Salah Messikh, the chief executive of Halal Polska, whose company has seen its annual sales rising 30% annually.